Multiple Chemical Sensitivity is an important introductory booklet. Highly informative, it provides a succinct overview that is easy for a layperson to read and understand. The publication answers questions that include: What is MCS? Who gets MCS? What causes MCS? What are the symptoms of MCS? How is MCS diagnosed and treated? 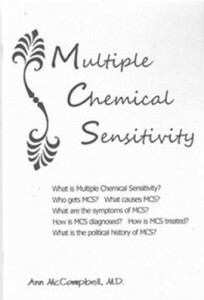 What is the political history of MCS?This booklet can be an invaluable resource for those who have recently become chemically sensitive. It has also proven useful in helping to educate friends, family members, doctors, government agencies, elected officials, and others about MCS. Dr. Ann also includes a section on the political history of MCS, as well references and resources. $5 each. Volume discounts available. To order, click here. Dr. Ann McCampbell trained in internal medicine and worked in women’s health before she became ill with severe Multiple Chemical Sensitivity (MCS) in 1989. She has been a leading chemical sensitivity and disability advocate for over 20 years. She is Chair of the Multiple Chemical Sensitivities Task of New Mexico and a founding board member of the Chemical Sensitivity Foundation. products, since individual sensitivities vary widely. Austin Air has the largest air cleaner manufacturing facility in the world. Austin Air’s Healthmate is the air cleaner of choice by leading doctors throughout the United States and many other parts of the world. Room and car purifiers help people survive in a toxic world. Manufacturing air purifiers designed for people with multiple chemical sensitivities (MCS), environmental illness, allergies and asthma since 1974. For use in homes, offices, schools, and even in automobiles and RVs! Janice’s natural comfort selection provides relief to thousands of people with sensitivities and allergies. Products include bedding, apparel, personal care, cleaning, household and laundry, and much more! Shop Livingreen for products for a healthier lifestyle, including bedding, cleaners, energy/air/water, gifts and kids.